MICRO SOFT వారు ఆధారపడి తయారుచేసిన OPERATING SOFTWARE ( System- OS) లో ఉన్న Bineray Code system మన వేదాలనుండి తీసుకోన బడినదే . Pingala(200 BC), author of the Chandaḥsaastra. matrameru, binary numeral system, arithmetical triangle. The Chandaḥśāstra presents the first known description of a binary numeral system in connection with the systematic enumeration of meters with fixed patterns of short and long syllables. The discussion of the combinatorics of meter corresponds to the binomial theorem. Halāyudha's commentary includes a presentation of the Pascal's triangle (called meruprastāra). Pingala's work also contains the Fibonacci numbers, called mātrāmeru. 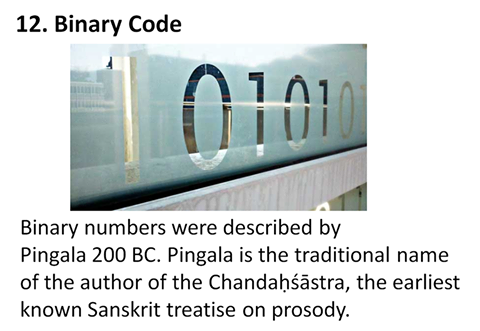 Use of zero is sometimes mistakenly ascribed to Pingala due to his discussion of binary numbers, usually represented using 0 and 1 in modern discussion, while Pingala used short and long syllables. As Pingala's system ranks binary patterns starting at one (four short syllables—binary "0000"—is the first pattern), the nth pattern corresponds to the binary representation of n-1, written backwards. Positional use of zero dates from later centuries and would have been known to Halāyudha.